last sunday, i was walking through the meat aisle (as i do almost every day) looking for a reasonably priced package of something tasty to cook up for lunch. i rummaged through the chicken parts for a little while, but i wasn’t inspired by anything. breasts were on sale, but eat breasts all the time. bacon popped into my head, but i immediately dismissed it. so i went back to the veggies and picked up some other stuff while i pondered. once i had mushrooms and a few other veggies in my basket, i still hadn’t come up with anything to cook, so i meandered back to the meat aisle. and there it was. there was absolutely no way i could have missed it as i walked past. maybe some saintly supermarket employee saw my pained look of lunch-time indecision and decided to run to the back, select a single package of awesome meat, and pop it into the refrigeration unit just before i walked by. maybe cherubs descended from heaven on high and put the package there just for me. maybe, like an abandoned puppy, the package was hiding in plain sight just waiting for someone who could truly appreciate its greatness to notice. in any case, when i saw the extra lean piece of pork tenderloin, i used every ounce of restraint i had not to jump for joy. it was so out of place i half expected there to be a fishing line with a maladjusted child on the other end. i thought as soon as i reached for it, it would jump off the shelf and i would have to chase it through the store, only to be pranked and laughed at in the end. i placed it in my basket and almost ran to the check out line. i actually whistled on the walk home. did people look at me like i was a madman? maybe a little more than usual. but i didn’t care. i knew they were just jealous. jealous because i was going to have exquisitely roasted pork tenderloin for lunch, and they were going to have something else. some tenderloins have a silvery skin still in tact when you remove them from the package. make sure to use a very sharp knife to remove that before you get to cooking. mince the garlic and basil leaves. drizzle the length of the tenderloin with a little bit of olive oil, then sprinkle it with all of your spices starting with salt. massage the spices into the meat with your fingertips. tear a large piece of plastic cling wrap and place the spice-rubbed tenderloin at one end of it. spread half of the garlic and minced basil on top of the tenderloin, flip it over, and do the same to the other side with the remaining garlic and herbs. roll that baby up super tight. make sure the garlic and herbs are literally crushed into the side of the meat by the plastic wrap. make sure the package is sealed, then pop it in the fridge for an hour or two. while you are waiting, very carefully wash your mushrooms and pat them dry. use an extremely sharp knife to cut the head into four evenly thick slices. the nautiloid arrangement of the mushrooms will make the slices an irregular fan shape when cut carefully. melt one or two tablespoons of butter in a saucepan, then add one mushroom slice. flip it to make sure both sides are evenly coated with butter. repeat for the remaining slices. when finished, add them to a parchment paper lined baking pan. finally, sprinkle them with a dash of garlic powder, salt, and black pepper. once your wait time as elapsed, carefully unwrap the tenderloin. add a little bit of oil to a frying pan and get it nice and hot. pop the tenderloin into the pan and quickly sear it until brown on all sides. your goal isn’t to cook it right now. the goal is to use that garlic and those spices to create an exterior husk which will prevent juices from leaking out. 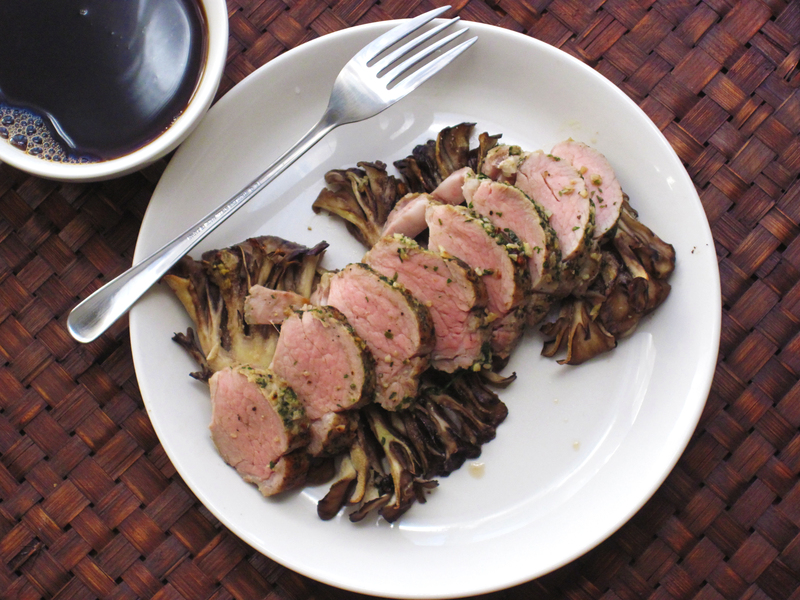 once browned, place the tenderloin on the pan with the hen-of-the-woods and slide everything into the oven. let everything cook for about 12 minutes. remember, for the love of all that is holy, don’t overcook it. overcooked tenderloin is the worst. if it is underdone, you can always cook it more. ready a large piece of foil. as soon as the cook time as elapsed, take out the pan, and wrap the tenderloin with the foil. make sure to create a tight seal to prevent any juices from escaping. put the mushrooms back into the oven. after another five minutes, take the mushrooms out and plate the slices in a line. unwrap the tenderloin and use a very sharp knife to cut thick medallions. place the medallions on top of the mushrooms slices. pour the juices of the tenderloin (some of which no doubt escaped on the cutting board while you were sliced) over the top of the meat. ready your knife and fork. pour yourself a cup of black coffee or a glass of wine. put on some classical music, maybe chopin. enjoy what could be the classiest lunch of your life. This entry was posted in eye candy, lunch and tagged Classy, Easy, Lunch, Mushrooms, Pork, Roast, Tenderloin, Toaster Oven. Bookmark the permalink. ← kimchi fried rice: waste not, want not. If I said “cherubs descended from heaven” to my butcher, he probably would hit me. Lovely plating btw. i appreciate the plating comment. i’ve been trying really hard this year to improve that part of my cooking. i used to be really really bad at it, so it is nice to get some positive feedback now and again. I do understand. It’s very difficult. A bit of success will spur you on to greater things. Great pictures! Looks delicious as always. thanks dude, you should have been there. i’ll be sure to let you know next time one just happens to be sitting in my fridge. There’s just something about perfectly prepared meat that brings a tear to the eye. Brilliantly done. overcooked tenderloin brings tears to my eyes, too. but they are tears of sorrow and remorse.